For as long as Boyd can remember, he’s been pushing pins into a map. Carson City, Las Vegas, Albuquerque—all places he wants to see, for a dozen different reasons that wouldn’t mean a thing to anyone else. When he finally gets a chance to purchase the ’69 Road Runner of his dreams, at a price that even he can manage, Boyd jumps at the opportunity. Oliver seems like just another kid with a broken dream when their paths cross in Vegas. Against Boyd’s better judgment, he offers to let Oliver hitch along for the ride when Oliver confides the need to get out and get gone. But it’s not long before Boyd realizes Oliver’s reasons for running are more complicated—and more dangerous—than Oliver let on. But Boyd doesn’t like people who play hardball, and he definitely doesn’t like people messing with a man who’s managed to light a fuse that Boyd forgot he had. A.F. Henley’s story is drawing strength from two different things. Its very likable and relatable characters and the scenery. Boyd’s life is a very desillusioned one. He is working as a car mechanic day in and day out. He earns just enough money to pay the bills and to put aside a little bit of money from time to time. Being only 35, he feels like he has nothing to expect from his life. But for years, Boyd has this dream of going on a Road Trip. He has a map, marked with stops from the west coast to the east coast. He placed those marks for no other reason because of a memory, something he saw on tv as a kid or for no other reason just because he wants to go there. I love the kind of duality that shows in Boyd’s character. While he is cautious to do anything daring, because he thinks that at his age life is all about responsibility and not chasing dreams, he is carrying this seed inside him. Maybe it can even be called an urge. To break out of this boring life. Doing something for no other reason because HE wants to do it and not what others expect him to do. So when the opportunity arises to buy the car of his dreams in California, he jumped at it. Flying over from the east coast to get the car and taking the car back home on a road trip! It is a one in a million chance and he is not going to miss it! But we all know Karma. You take her small finger when she offers it and what you get is the full load of adventure! Boyd, while being grumpy on the outside has a true heart. So when he makes a stop in Las Vegas, Fate let Oliver cross Boyd’s path. Oliver, 24, is the kind of character who sparks the need to instantly cuddle and protect him. Although he can be cocky he is also adorable. When Boyd meets him, Ollie is beaten, with no money in his pocket and seemingly nowhere to go. Although his mind strongly suggest to stay out of trouble, Boyd feels the need to offer help. Oliver reacts unapproachable at first, believing that Boyd is a john. This line of thought combined with Oliver’s distressed appearance tells the reader a lot about Oliver’s situation and makes one contemplate what happened to the boy in the past that he thinks the way he does. Finally Oliver agrees to Boyd’s offer to take him home to the east coast. Without either of them being aware of it, they are at the beginning of an adventure that ends in a shocking revelation of Oliver’s past. When they take off to their trip back to the east, Boyd is always expecting that Oliver might be more trouble than he is worth it and Ollie in return is not sure that all Boyd wants from him is his body. Very slowly they begin to develop a cautious friendship. A.F. Henley wrote an awesome story in so many ways! While Boyd’s and Oliver’s chance meeting slowly develops into a friendship, he never allows the reader to be sure if this is ending into a happy ever after. Oliver is hiding something about his past from Boyd and the reader will not know until the end which makes for a constant tension during the whole story. Although there are happy moments between the two, I could never stop that feeling how a shadow is hovering over their happiness and I was honestly worried about the ending. Henley did a brilliant job! 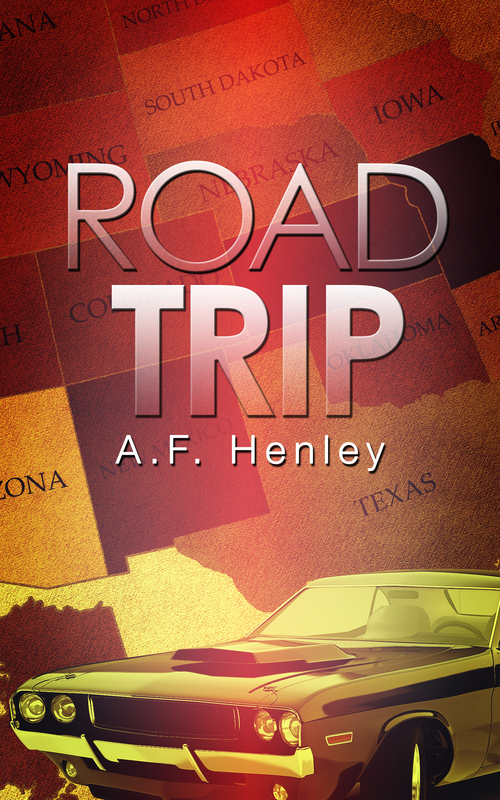 On one hand Road Trip is a delightful and fast paced story, on the other hand Boyd’s and Oliver’s relationship is progressing at a very realistic pace. There is no love-at-first-sight. There are no rainbows or unicorns. Instead Henley, during the course of the story, makes the reader realize how both men, as different as they are, are the same side of the coin. Or to use a more popular phrase, they are like ying and yang. Not being naive, Oliver still has the ability to dream and has a very strong opinion that life should not be only about duties and obligations. There are some wonderful moments between Boyd and Oliver and Boyd begins to understand how Ollie embodies what Boyd has long lost along the way. Something else I loved about the story is the humour! A.F. Henley has a wonderful sense of humour! And it shows in such a wonderful way when it comes to the age difference between Boyd and Oliver! Another big plus is the background Henly provides; the trip back to the east coast. It was so easy for me to feel a breeze on my face while listening to awesome music and feeling the car’s engine roaring! A wide open landscape, blue skies and beautiful sunsets add a lot to the good vibes the story is sending.